The kids and I have been on a little bit of the John Wayne Pioneer Trail/Iron Horse State Park twice: five years ago with the old mama bike and balance bikes and two years ago with the Big Dummy and kid pedal bikes. Both super fun and epic by our standards. 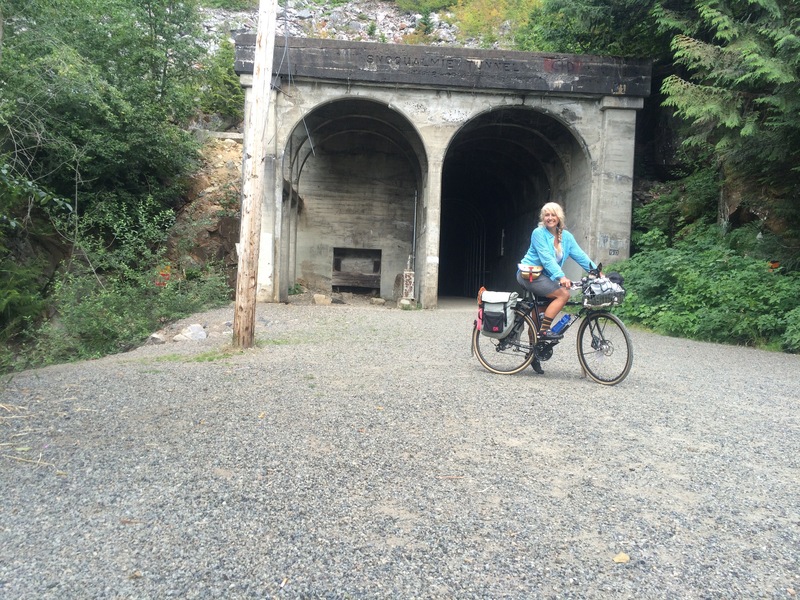 But with the kids away on a vacation and a couple days to kill before my Mount Rainier and Mount St Helens trip with Brad (yes, same Brad from the Iron Horse trips of yore), I thought it’d be fun to ride all the way to and through the tunnel with Pixie. In a nutshell, it was awesome, but I took a not-so-nice route to get to the start of the start of the trail so I need to try it again. Pictures! Flickr: Iron Horse Trail – August 7-8, 2016 (261 photos, 1 video). I did a teensy bit of research before heading out, but when I don’t bring the kids along I tend to be a little more fly-by-the-seat-of-my-pants since I’m only responsible for myself. 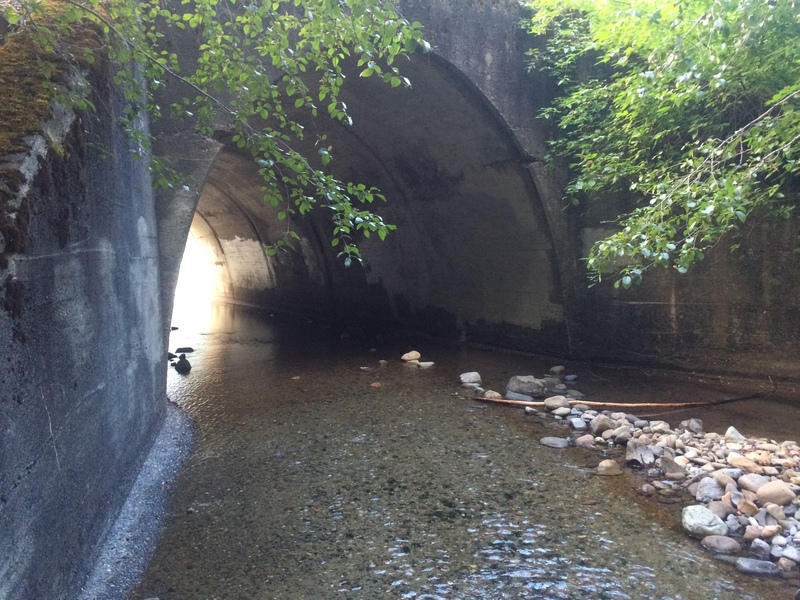 so I knew ahead of time I wanted to ride to Cold Creek Campgrounds just past the tunnel. And the night before my trip was the Dead Baby Downhill so I was able to ask a few friends for route advice in person…because discussing routes while watching adults on tiny track bikes in a mini velodrome adjacent to tallbike jousting is the best way to figure out a trip 10 hours before the fact. Since I live up in Wallingford, it sounded nice to go over the top of Lake Washington rather than head south for the I-90 trail. Not to mention much more flat. And the beginning was great: Burke-Gilman Trail to Sammamish River Trail to Marymoor Connector Trail. But then roadkill-strewn Redmond Fall City Road / highway 202 was not very nice. Granted, it was better on Sunday than Monday–there were many more big trucks on the weekday trip home. 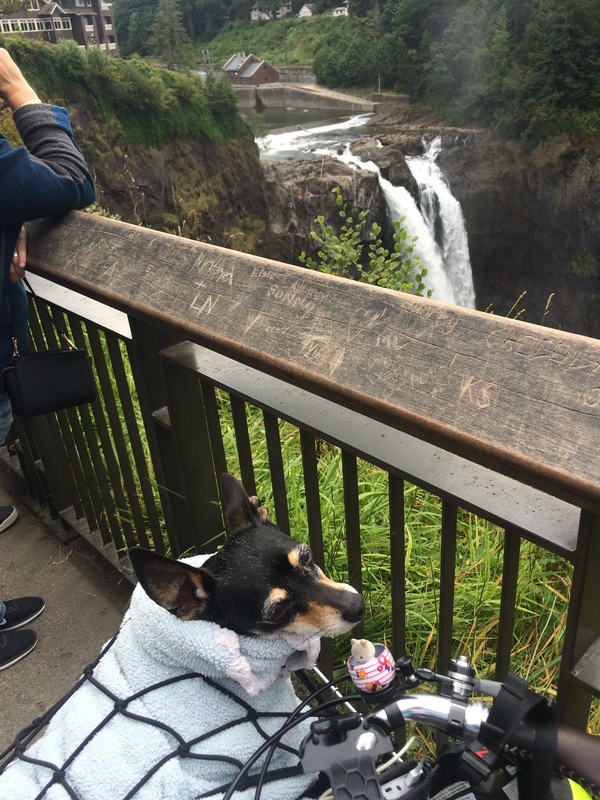 One little bonus: this route took me to the top of Snoqualmie Falls so that was pretty cool! I’ve been there once before, years ago, in a car. After that it was pretty nice and quiet, but following the Google Maps app on my phone took me away from the all-trail route I should have taken and I had a lot more climbing that I should have. And that meant I didn’t find the grocery store in North Bend mentioned in the Seattle Bike Blog post and ended up at a small golf course market. 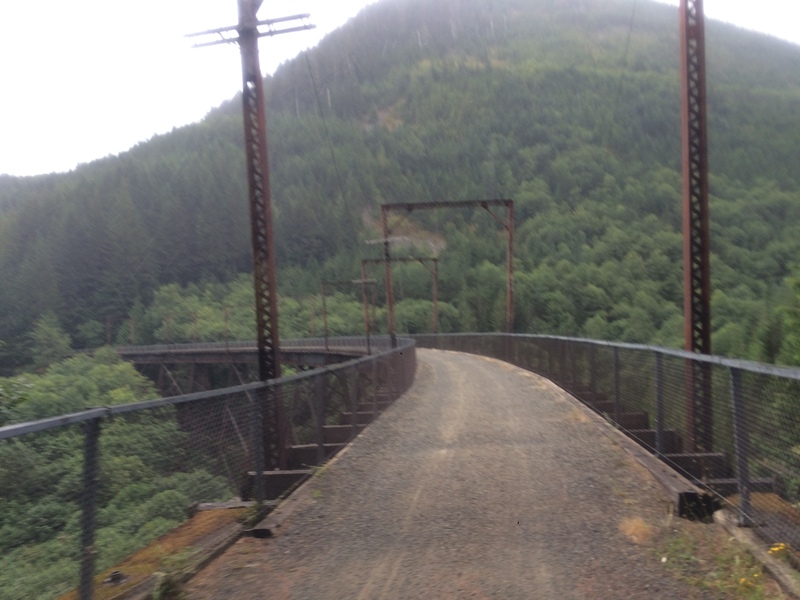 But soon enough I was at Rattlesnake Lake and on the Iron Horse Trail! The 2% railroad grade gravel is awesome. I knew from our first family biking trip there that other people were surprised by how slowly they moved–about half the speed they had expected to tour at. My normal alone biking speed is slowish so I had a great time. Not having to worry about tired and hungry kids or keeping up with faster friends makes for a relaxing trip. I’ve done a couple other solo trips, to Illahee in April and to Fay Bainbridge last summer. But those were a lot smaller than this. Side note, Bicycling Times posted a nice feature, ALONE, a week after this trip. My Surly Straggler has Compass Barlow Pass tires–700c x 38mm kept at fairly low tire pressure: 30 psi when not loaded for camping, and they were probably at 40 psi for this trip, but looking back I realize I didn’t bother checking ’em, oops. I didn’t see a ton of other people on the trail, but it’s OK with any sort of bike. I saw quite a few people on mountain bikes, some on cyclocross bikes, but having been on it previously on my city bike and my cargo bike (I guess the Big Dummy could best be compared to a rigid mountain bike for these purposes), don’t let not owing the “right” type of bike stop you from checking it out. 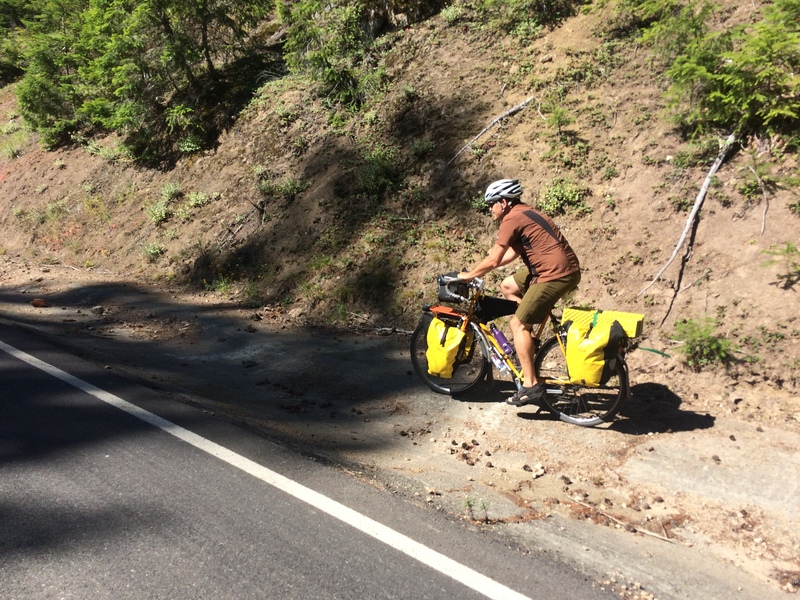 I didn’t find any patches of loose gravel on this big trip, but there are doubtless periods when new gravel has been placed in sparse spots making it not as easy to bike through those particular small areas while it’s fresh. Cold Creek Campground was really pretty. It was too cold for swimming and I forgot my mosquito repellent so I didn’t do any exploring, but I will in the future. There’s no running water so being alongside a creek in which to use my Sawyer MINI Water Filtration System was good. I discovered one trick on this trip and utilized it on my way home: hang your mug on the outside of your bike (or at least don’t bury it at the bottom of a pannier) to help fill water bottles at drinking fountains that don’t easily accommodate bottles. This would have been helpful on day one at Wilmot Gateway Park in Woodinville, a popular stopping spot judging by the number of people on bikes there and did come in useful at the Three Forks Off-Leash Dog Park on day two. Also, it’s a good way to clue in onlookers that you’re bike camping and not just out for a little ride. Displaying your tent poles helps with that, too. For real, though, packing your tent poles separately is a great way to better fit the rest of the tent in a pannier. Pixie did great for the long trip. She’s quite the homebody and would ideally have us all stay home with her all the time, but her second favorite thing is to chill in the bike basket. She’s seven so she doesn’t require a ton of exercise, but I took several breaks for her to stretch her legs at parks and she ran alongside me for part of the trail on day one and that was awesome. She also isn’t much on eating away from home, but I was able to entice her by putting treats (lamb lung!) on top of her food. However, she ate a lot more than I thought she would and we almost went through all her food so I’ll have to pack a lot extra next time. This has happened on our Fay Bainbridge trips, too, so I thought I had packed extra, but apparently not extra enough! Heading home I decided I’d reverse my route over since it felt mostly uphill and the thought of mostly downhill seemed nice. But as I mentioned before, the 202 was even worse on Monday. So I won’t make that mistake again. But I will most definitely do this trip again. And perhaps next summer with the kids on their own bikes, letting the bus take us part of the way there! 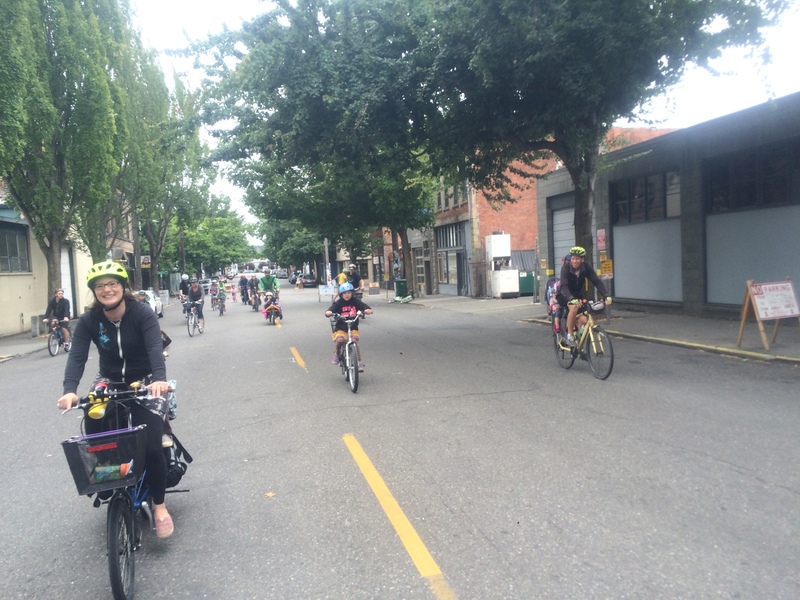 Saturday’s Ballard Summer Parkways was awesome! We didn’t do the entire 3.3 miles so I can’t speak to the entire event, but what we experienced was terrific. I heard there were bounce houses at both Salmon Bay Park and Loyal Heights Playfield, but the kids were having so much fun at Ballard Commons Park that we stuck there. 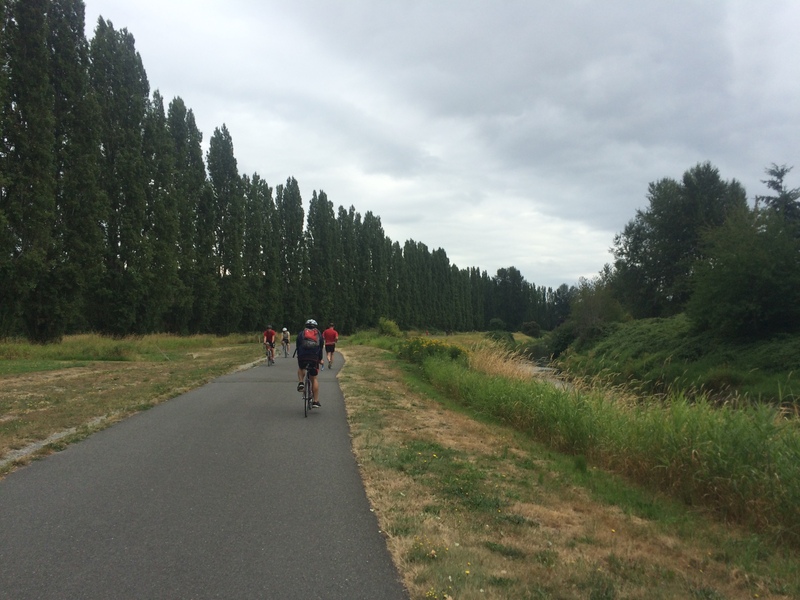 We had a great location, across the 22nd Avenue from the northeast corner of Ballard Commons Park so we were perfectly placed for bike test rides along the 58th St Greenway and situated on the Parkways route. The Family Bike Expo offers test rides of a variety of bikes, as of recently has a balance bike on hand for toddler entertainment, and is a great way to talk to family biking “pros” about anything and everything family biking, including scheduling a family bike rental. More about all that at the Familybike website. We hung out until 11:30 decorating bikes and helmets and then gathered all the bikey families and brought them through the park to the stage area for the official announcements. Unfortunately I had to follow word of FREE ICE CREAM, but it turns out kid bike parade is the only thing that doesn’t pale in comparison to FREE ICE CREAM. Phew! And then we led Kidical Mass around the lower loop, through Historic Ballard. We had 61 bikes along which is pretty big for a Seattle Kidical Mass, though not as huge as the 200+ during last year’s Ballard Summer Streets/Kidical MASSIVE. One of our riders got a great video of our ride, posted to his Instagram. We stayed until the bitter end at Ballard Commons Park where the kids made bird feeders, watched the Bubbleman, over-decorated their bikes, but mostly just biked back and forth along the closed streets. There’s one more Seattle Summer Parkways–West Seattle Summer Parkways on September 25th. I’ll organize bike decorating and a kid bike parade again (full details coming soon) and then spend the rest of the day volunteering for the Disaster Relief Trials which is the MOST FUN EVENT EVER! Saturday, August 27, 2016 – 11:00 a.m.
Join me on a Kidical Mass ride for Familybike Seattle during Ballard Summer Parkways! Like last year’s huge Kidical MASSive at Ballard Summer Parkways event, we’ll start with bike decorating and then parade along the closed-to-cars streets. Bike decorating begins at 11:00 a.m., bike parade happens at 11:30 a.m.
Find me and the bike decorating at the Family Bike Expo booth. This is also where you can volunteer to talk to families about family biking and/or leave your bike as part of the expo once we’re done parading! Sign up for that on the Family Bike Expo Volunteer Sign up Google doc, or if you can’t access the online document email morgan@familybike.org. The parade will be short–probably just around the lower loop of the event–and move slowly–parents walking alongside kids on balance bikes will be able to keep up. The entire event runs from 11:00 a.m. to 4:00 p.m. with oodles of fun stuff going on the entire time. The second event in our series will bring the fun back to Ballard! We are partnering with the Sustainable Ballard Festival, Seattle Parks and Recreation and dozens of community partners to bring safe streets and sunny fun to Ballard. 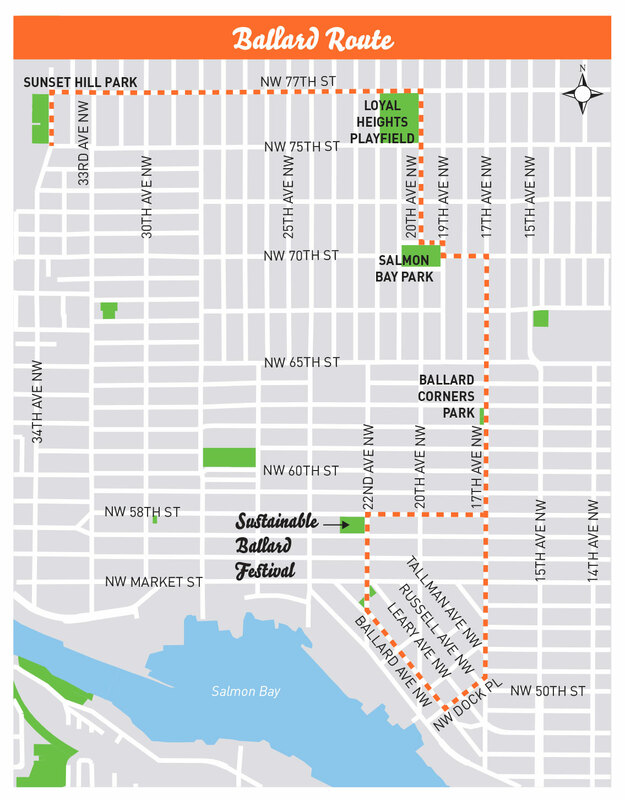 This route will highlight some of the beautiful natural areas and vibrant neighborhoods located in Ballard, such as Ballard Commons Park, Ballard Corners Park, Salmon Bay Park, Loyal Heights Community Center, Sunset Hill Park, Bergen Place Park and the myriad shops and businesses along Ballard Avenue. Eclectic, artsy, earthy, urban and committed to a better future…you’ll find all this and more at the 13th Annual Sustainable Ballard Festival. You’ll encounter creativity, passion and community while learning about daily practices and big steps toward more sustainable living. In a time of uncertainty about our nation’s leadership, People Power has been chosen as this year’s festival theme as a reminder of what is still possible locally and as a model for all communities. As always, the fest is FREE to the public and perfect for families. The Mayor is expected to kick off the fest and a bike parade organized by Seattle Summer Parkways. Seattle Summer Parkways There will be a creation station for bubble wands, musical instruments, and bottle cap flowers. Find skateboard lessons in the skate bowl, a family bike expo on the street, goats and chickens in the urban farm zone, live music on the solar powered stage, and birdhouse building with festival sponsor Built Green. Local businesses offer games, activities and prizes with a green twist. There will be food carts, of course, and a Tea Garden presented by Miro Tea, a fundraiser for the festival featuring local desserts and unlimited tea sampling for a $5 donation. 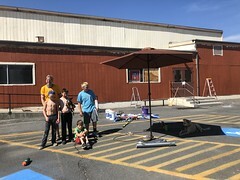 We invite all of our Ballard neighbors and friends to become more connected with each other by participating in Sustainable Ballard activities. When we engage, we become part of creating the thriving community and lifestyle we want and need. My friend Brad and I had some overlapping kid-free days so we left our Big Dummies and tandem bikes at home for a multi-day bike tour on single-occupant bikes. I’d never done multi-day/multi-site bike camping, and last year marked the first time the kids and I camped for more than just one night period (on Vancouver Island over Spring Break and at Fay Bainbridge Park in August). 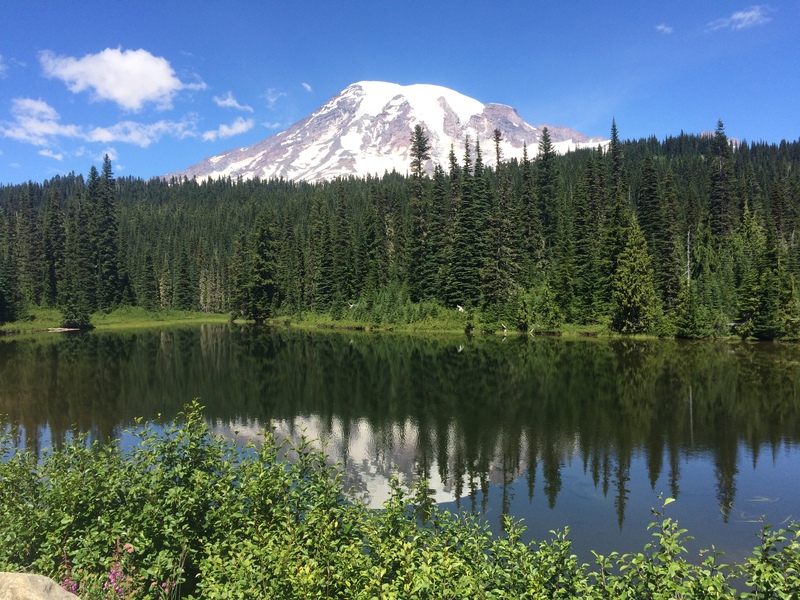 Here’s the photo album: Three days around Mount Rainier (and to Mount St Helens) with Brad (435 photos). Brad and I usually ride with our four respective kids–like when we went bike camping at Manchester State Park last month. This trip was very different. I’ve known Brad for years through family biking, but he’s also a randonneur so I should have realized going into our trip that it would be really hard. 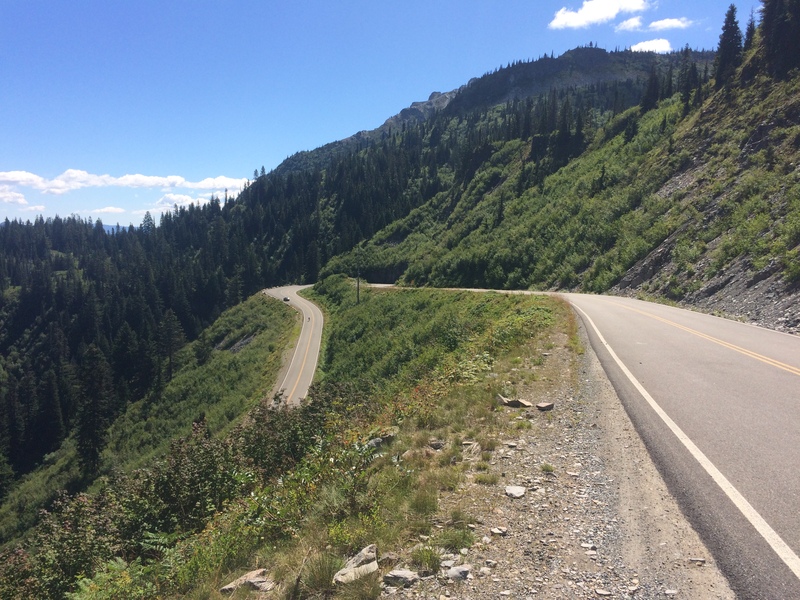 Note to self: no more bike touring with randonneurs–it’s too hard! That said, it was also really fun, and I’m glad we went. But I’m glad we ended up coming home a day early and I’m REALLY glad we cut out two of the mountain passes Brad had planned. 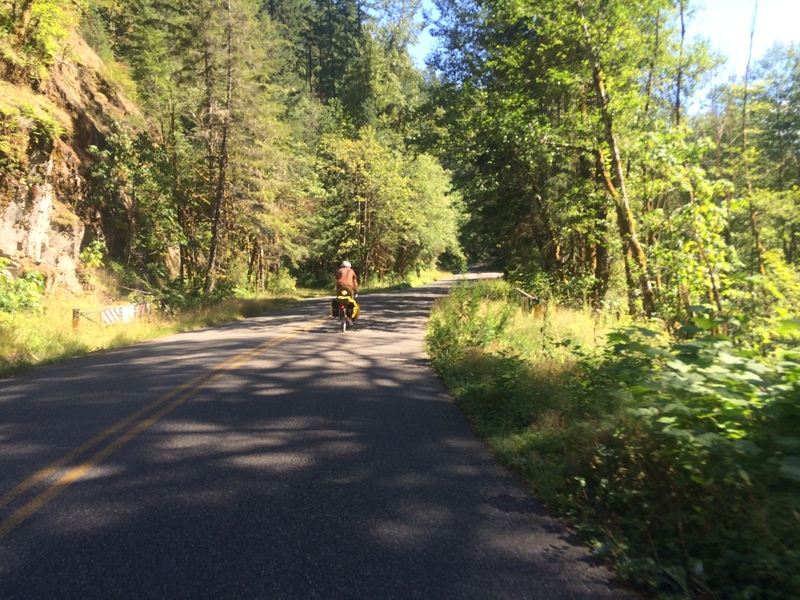 I feel a great sense of accomplishment at our miles and elevation biked, and the scenery was spectacular, but the best part was the people we met along the way. Brad plotted our route, including checking with other randonneurs about the status of washed-out roads, plus he was familiar with a lot of the area thanks to Seattle International Randonneurs events. So I just answered “yes” to any route questions posed to me, let all the details go in one ear and out the other lest the number of miles or mountains intimidate me, and blindly followed along. Now, I love leading rides and planning routes, but it’s so nice to take a break and not do any thinking about things every once in a while! He mentioned taking the bus to cut out the “boring miles” and get out of the city faster so that meant I had to take my road bike, since the front rack and basket on my Surly Straggler mean it doesn’t fit on the bus rack. 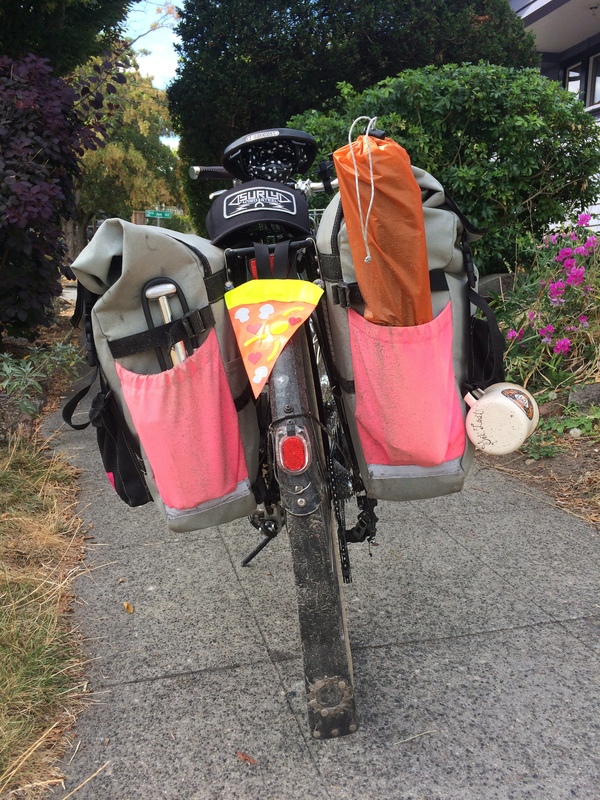 I knew from a recent trip to Veneta, Oregon (which I hope to at least post photos of soon, if not also do a little blog recap) that I could fit my camping gear on my road bike. And I was happy to have my lightest bike along for the big ride, though that meant no room for Pixie so I left her behind with a friend. My tires are 700c x 25mm at 110psi (max tire pressure is 120psi) and they proved uncomfortable on the miles and miles of bumpy chipseal. Perhaps the aluminum frame (versus steel) added to that, but it was probably more about my tires. My Surly Straggler’s (steel, btw) tires are 700c x 38mm and I keep them at 30psi. Big difference! But with that bike come two big panniers and a front basket and I tend to shove as much stuff as I can in all that room so it would have been much heavier. 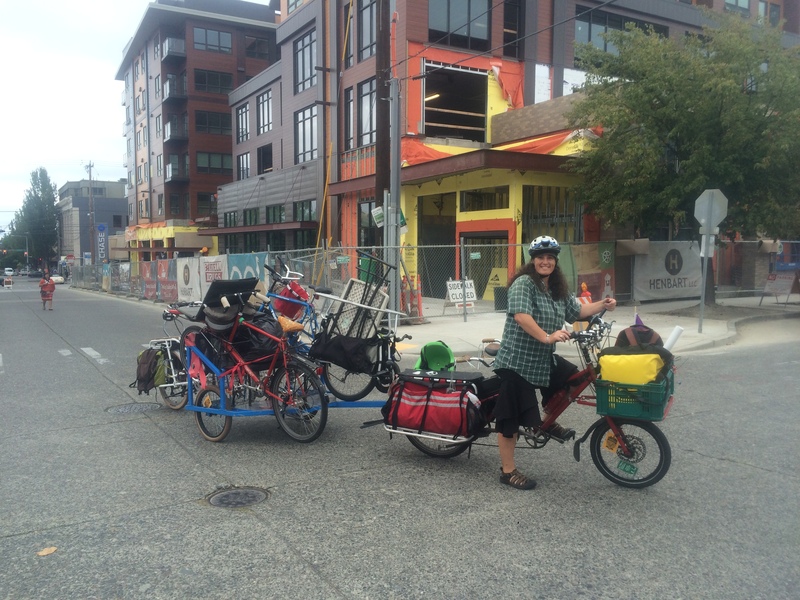 Brad rode his Surly Long Haul Trucker with four panniers (two of which started out empty), a small frame bag, and a handlebar bag. He offered to carry a bunch of my stuff so I could better keep up, but I don’t think the small weight of my gear made any difference–I’m a much slower rider than him in general. But still, I let him carry increasingly more stuff: rain jacket on day one; rain jacket and sleeping pad on day two; rain jacket, sleeping pad, bag of extra snacks, and tent poles on day three. Had we kept our day four, I’m sure I would have ported over all my stuff. Taking the bus (Sound Transit 578) to Auburn cut out 20 miles. We cut through the Seattle Center (Space Needle!) to get to the bus stop so at least I got a good little dose of city riding, since that is my thing after all. 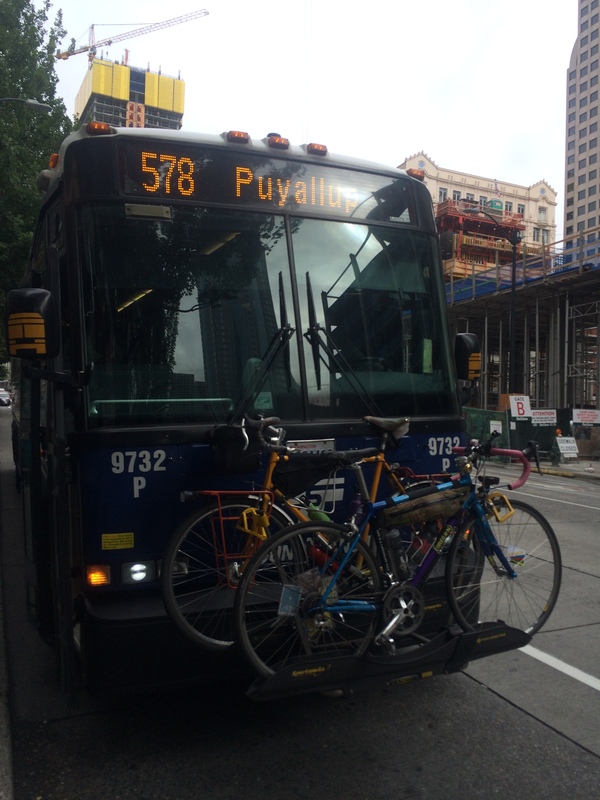 While most Seattle area buses have three-bike racks (all King County Metro and most Sound Transit buses can carry three bikes, I think), the 578 had a two-bike rack. So we were lucky there wasn’t already a bike on board. 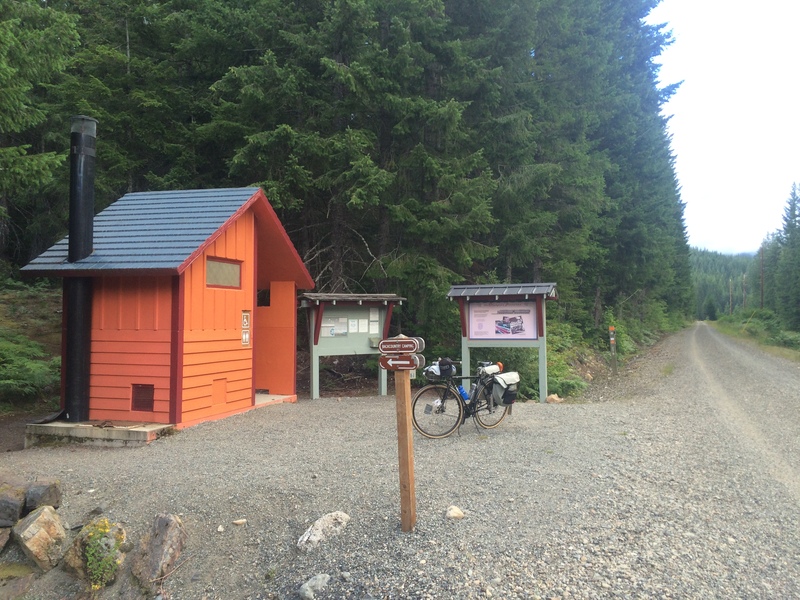 It was fun to recognize a couple places from my first big bike overnight, the Swift Campout to Ipsut Creek. First up was Enumclaw-Black Diamond Road, though Brad and I took it in the easier direction, and at the beginning of our day. Then we stopped for lunch at the Safeway in Enumclaw, our return lunch stop of the Swift Campout. 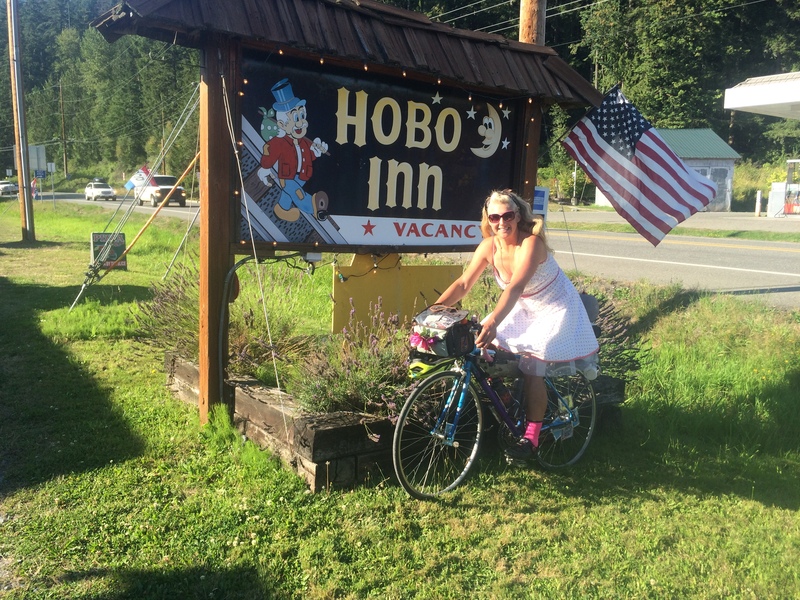 And this is where we made our first friend of the tour, Claire from Seattle, who had biked all the way from Capitol Hill on an old Schwinn mixte with a backpack and no firm plan, other than to take a few days to explore around Mount Rainier. We bumped into her two more times over the course of the day so that was really fun. We took a look at summiting Crystal Mountain. I’ve never been there in the winter (I’ve been to Stevens Pass once and Summit at Snoqualmie a bunch of times) so it sounded exciting, especially since we could ride the gondola at the top. But there was no way we could bike to the top (six miles) in the hour before the gondola closed due to intermittent road closures for construction. However, we could have made it up in time were we able to catch a ride in the back of the construction truck. The friendly construction worker checked with her boss if it was OK to give us a lift up the mountain, but unfortunately she didn’t have enough time before the tar arrived at 5pm. Oh well. It was a fun almost-plan! Our next almost-peak was Sunrise, but with so many clouds in the sky, we weren’t sure we’d see Mount Rainier. So we biked down down down to the White River Ranger Station to check the conditions. Brad said the park ranger would be able to tell us about visibility, but the gate and ranger station were already closed so we flagged down a passing car to ask some fellow park visitors. Conditions were spotty so we decided to skip seeing the sunset at Sunrise. But we did learn that restrooms are now called “comfort stations” and we saw Claire for the last time as she arrived to camp at White River Campground. 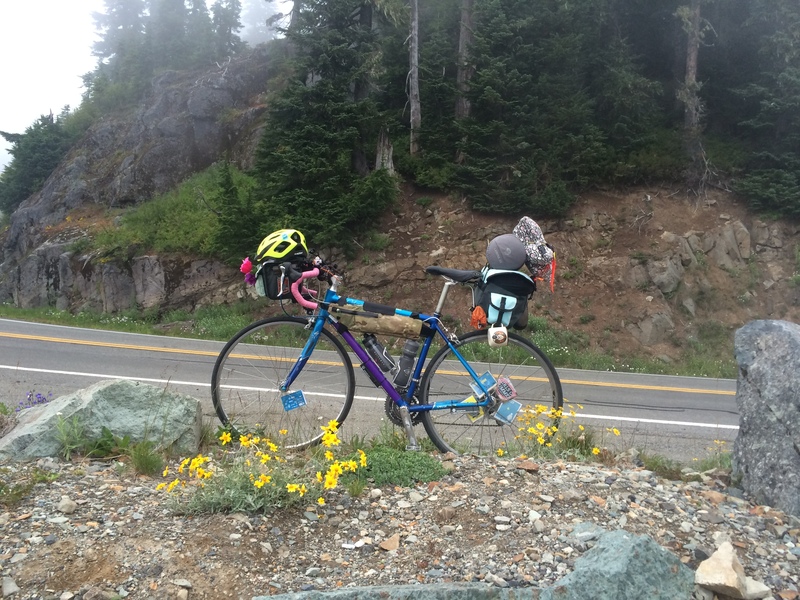 So we biked up up up to the top of Chinook Pass. It was exciting to see the first bit of snow–proof that we were up high in the mountains! And I saw one marmot close to the top, but I didn’t get a picture of him. 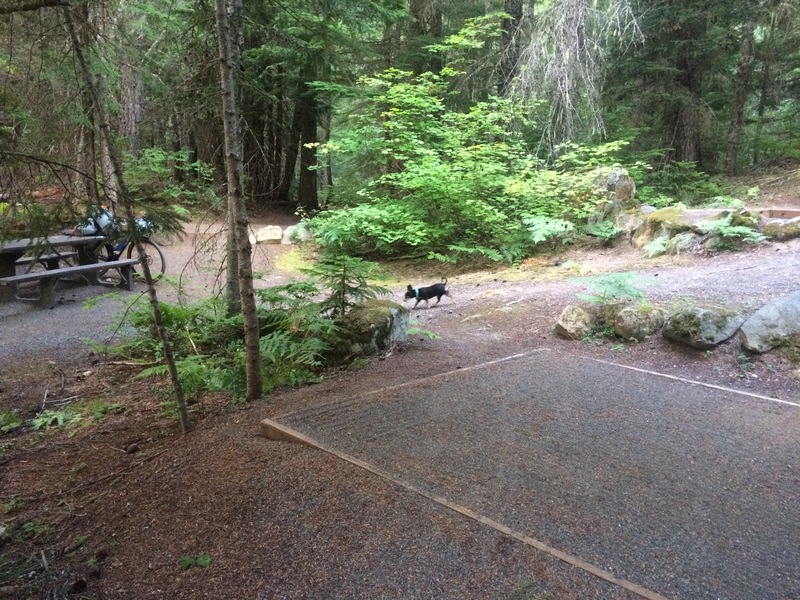 And then we biked down down down to Ohanapecosh Campground. The descent from Chinook Pass to Ohanapecosh was ridiculous! You know when Bugs Bunny falls down a hole and screams and flails for a long time and then gets bored of screaming and flailing so he sits in an easy chair and reads the paper…and then he makes a cup of tea…and then he yawns and puts on his jammies, sets the alarm, and goes to sleep…and then the alarm goes off and he jumps up and starts screaming and flailing again? It was like that. Sooooo loooooong. Ohanapecosh was a great campground! We arrived at night and chose a walk-in site, which is not like the hiker/biker sites I’m used to, but rather means you park your car in a parking lot and walk a few extra steps to your site. And the walk-in site area doesn’t have a bear box like the other areas do so we stashed all our food in one pannier and stuck it in the bathroom, not having a bear-proof vehicle like everyone else. This would definitely be a great campground to rent a car and come to with the kids (or bike to when we’re all up to this long of a journey). The visitor center was great as was the variety of programming in the amphitheater. We started our day with a long climb to Paradise. I’ve been once before, but by car, so it was really exciting to arrive by bike! It was a long, slow ride, but filled with tremendous views. The first of the three Reflection Lakes reflected Mount Rainier perfectly, though someone piloted a drone low over the lake, creating ripples. On the way up, we stopped to let a mom and daughter cross the road from the Cowlitz Divide Trail. We stopped to talk and learned the mom is a tribal leader of the Cowlitz Tribe and in the space of ten minutes, we learned a ton of history. 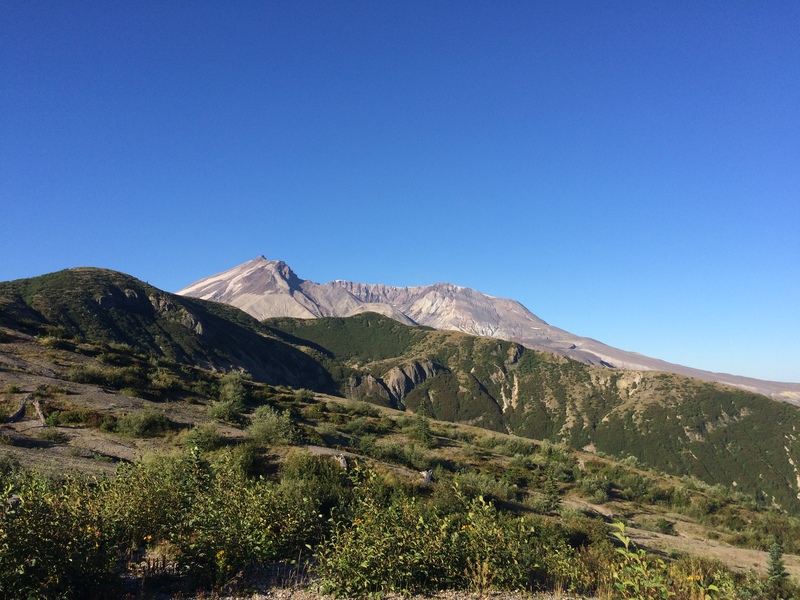 Here’s a tidbit for you: the Cowlitz word for Mount St Helens is Lawetlat’la. It was also neat to use Strava FlyBy to identify and “give kudos” (that means clicking the thumbs up on someone’s Strava recording) to the fast guy who passed us as we crawled up Paradise. 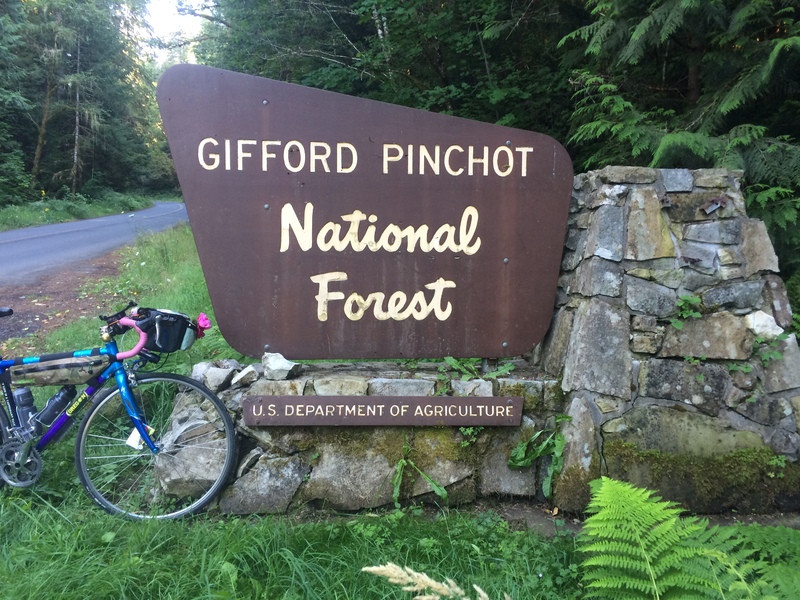 For heading down from Paradise, out of Mount Rainier National Park, and into Gifford Pinchot National Forest, Brad took us on a great forest road/service road/dirt road cut-through he’d ridden before. 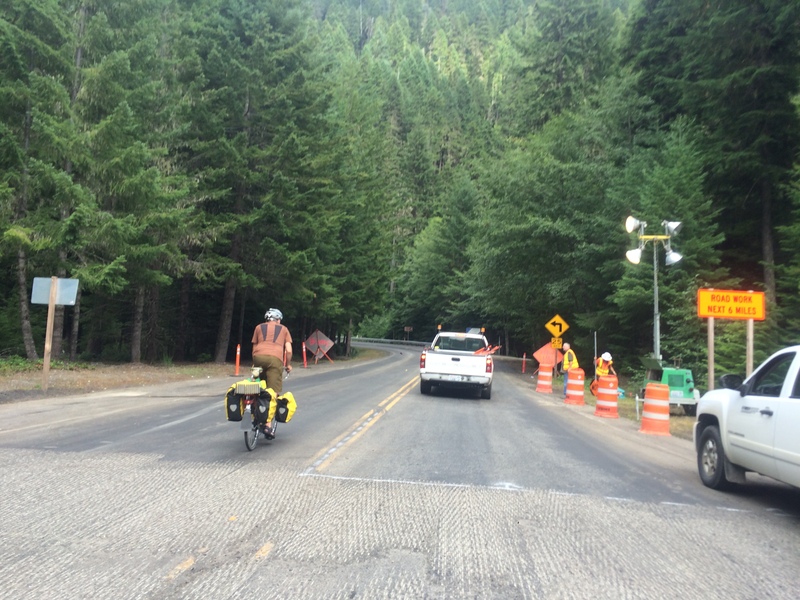 It led to the lovely Skate Creek Road, which is apparently Jan Heine’s (randonneur extraordinaire) favorite road. So while bike touring with a randonneur will make the miles and elevation really add up, it can lead to some great stuff. It also led to us finding our way to Cline Road to avoid busy highway 12 which was quiet with a few rolling hills, but we were chased by four dogs! So now I’m scared of farm dogs. Granted, one of those dogs was a tiny Yorkie. We stopped for lunch in Packwood and while stocking up for dinner and breakfast at the grocery store, a guy confided in us that the town is run by elk. I was kind of relieved to hear that because it explained all the NO SHOOTING signs. He said they know exactly where the signs are and keep on the right side of them. And when he has to open the pizza place early in the morning it often takes him an extra half hour because they’ll block his car in the middle of the road and only move aside when they’re ready. Brad didn’t seem convinced, but I’ve had a healthy fear of elk since I was a kid camping in Oregon and Washington and took the warnings to stay away from elk because they’re assholes (that might not have been the exact word the park rangers used) very seriously. It was late by the time we got into the Gifford Pinchot National Forest. I’m not sure if it was the result of the long day of biking or if the grades of routes 25 and 99 were really steep, but I had to slalom back and forth to get up the hills. It was too dark to see Mount St Helens, but the clear sky and half moon meant we had a terrific view of shooting stars from the Perseid meteor shower. Getting to see Mount St Helens and view the distinct flora (and lack thereof) of the blast zone in all directions in the morning was amazing. We met a few people setting up an aid station for the Bigfoot 200 Mile Endurance Run along the Truman Trail at the Windy Ridge Viewpoint. Oof, I can’t even imagine. Even with our less strenuous day planned, I was having trouble finding my groove. It may have been the two big days in a row, or having spent almost 12 hours in the saddle on day two, or something else (or all three! ), but even on the descents I was moving slowly. After many sluggish hours, we stopped for lunch in Elbe at the Mt. Rainier Railroad Dining Company and that fixed everything. Elbe is also a place I’ve been to before, but only by car. We didn’t have a set plan for days three and four, but were tentatively thinking about aiming for Orting where we’d either have to pay for a hotel or “free camp” (a term we learned from some nice bike tourers we met on highway 12 or 7…it was before lunch so I can’t remember where we were). Somewhere along the way we realized we could make it all the way home a day early, most easily done if we caught the bus again. Sound Transit 578 starts in Puyallup, but Sumner was closest to us if we could make it there by 9:19 p.m. 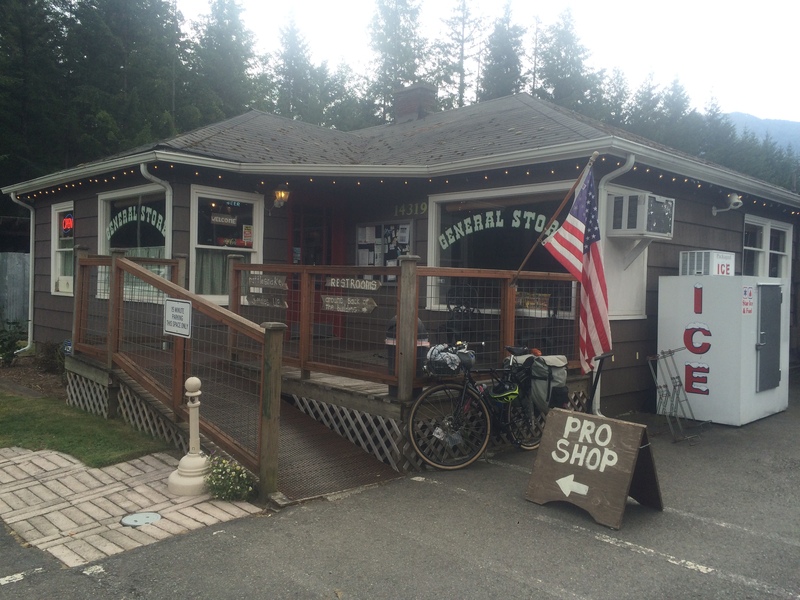 So I rallied and we picked up the pace and we arrived to Sumner Station at 9:03–a whopping 16 minutes early to snack and unload our bikes. This bus also had a two-bike rack, but the driver told us the last bus of the night will allow excess bikes inside. En route to Sumner I recognized Orting from having passed through in the other direction during Swift Campout. 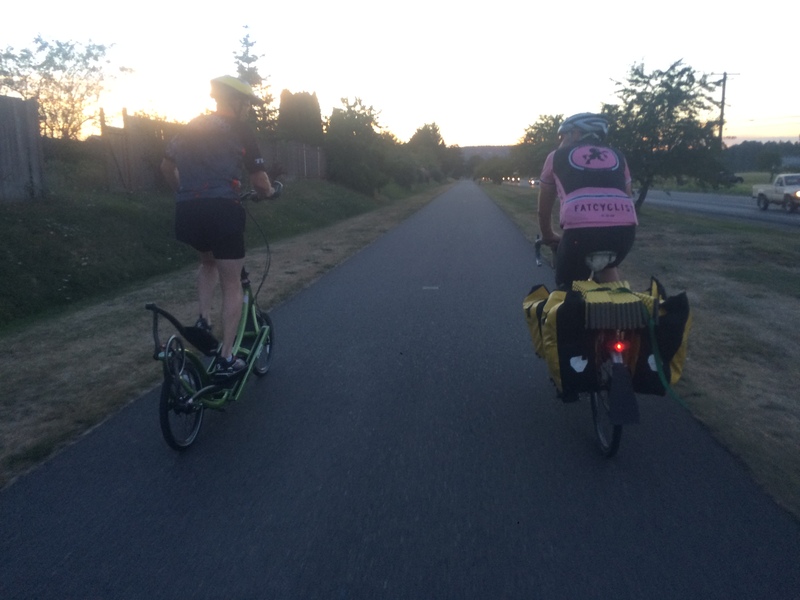 We raced along the Foothills Trail, though not as fast as the world’s fastest ElliptiGO rider (stepper?). He slowed his roll for a bit to chat with us. 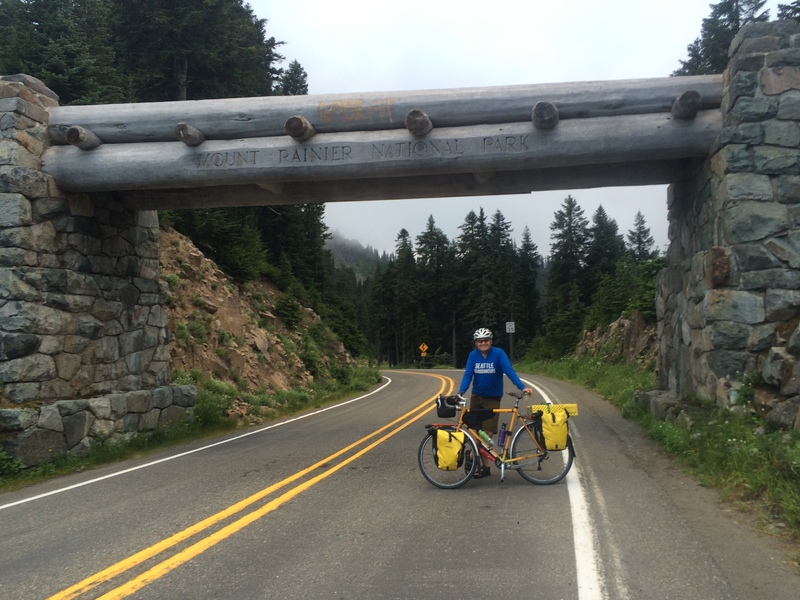 Turns out he’s doing the High Pass Challenge (a ride from Packwood up Windy Ridge–where we just were!) and will probably be way faster than a lot of the bike riders. I wish I’d brought my fingerless gloves along because by day two I was getting a bit of chafing on the sides of my forefingers where they rested against the hoods of my drop bars. I bought the gloves for biking the McKenzie Pass while visiting Eugene in May, but didn’t need them, nor did I use them for biking from Seattle to Portland shortly after that. So it didn’t occur to me to bring then on this trip. I ended up with a blister on the heel of one hand by the end of day three, but it wasn’t painful. And I got “hot foot” (a fancy term for an achy foot from being trapped in a tight cycling shoe all day) halfway through day three, but stopping for lunch and taking my shoes off while eating meant I could make it through the rest of the day relatively discomfort free. In addition to having a tremendous time in Mount Rainier National Park and the Gifford Pinchot National Forest, we did so very cheaply. We arrived too late to pay one entrance fee and a nice park ranger decided to waive our fee at another gate. So I settled up by donating, both to Washington’s National Park Fund (WNPF)–you can select the specific park–and the National Forest Foundation–you can’t select which forest, but you get to see how many trees your donation will plant.